Despite this precarious description, said pub still stands. 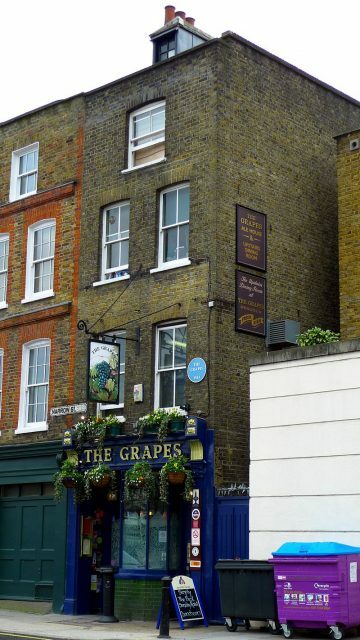 In the Limehouse Reach neighborhood of London, The Bunch of Grapes (now simply The Grapes), is a tavern that has been serving beer for over 500 years. Though public houses have stood on the exact site since 1583, The Grapes that exists today has been in business since 1720. 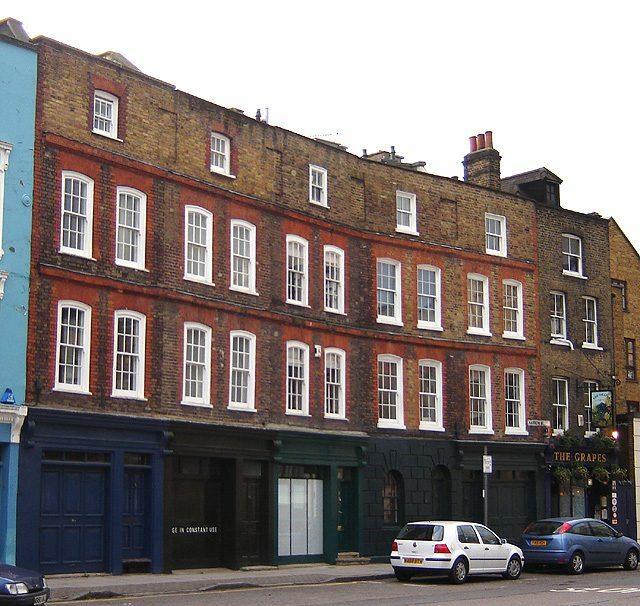 The building had seen Sir Walter Raleigh set sail for his exploratory voyages in the 16th century, had been frequented by Charles Dickens in the 19th century, survived the blitzkrieg of London in 1940-41, and played host to the infamous Kray twins throughout the 1950s and 1960s. 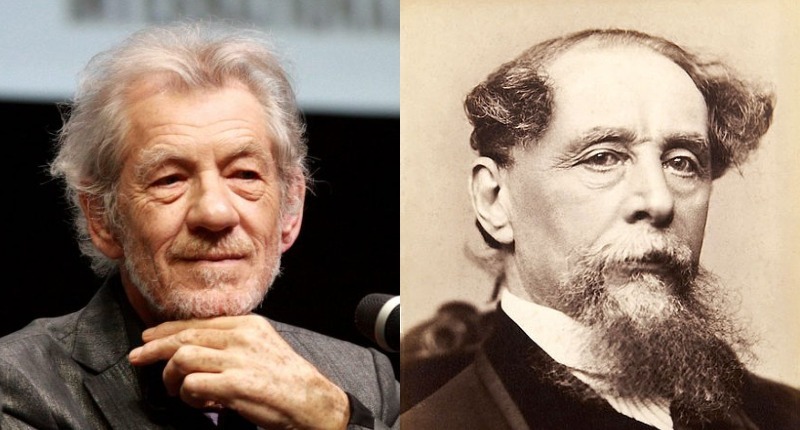 In 2011, famed actor Sir Ian McKellen bought the pub with two other business partners upon learning that its then-owner was looking to sell it, despite having no qualifications for running such a business other than an admiration for the historic tavern he’d been frequenting for the past 30-odd years. McKellen and his partners did some necessary restoration upon taking over the pub, giving it a good clean, but otherwise, the establishment continues to evoke nostalgia. Painted in shades of merlot with jewel-toned accents, the bar’s interior boasts classic wood paneling and a variety of oil paintings. One such painting hung above the bar, (not-so-) subtly depicts the three current pub owners along with Dickens. 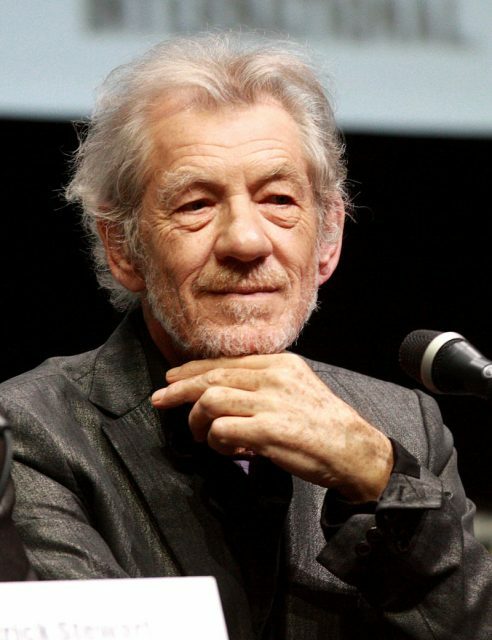 In an interview with AnOther Magazine, McKellen sat down to talk about his historic purchase. He speaks with a passion that makes you rethink if he owns The Grapes, or if it isn’t the entire East End community who’s collectively responsible for the management and wellbeing of the pub. Imports of illicit materials on the neighboring docks along the Thames river were well known at one time, lending to the implications that the Chinese opium trade could have found its way into the pub. In more modern times, rumors spread that the Kray twins, notorious gangsters from the East End of London, held a spare stash of weapons behind the bar in case they needed back-up. 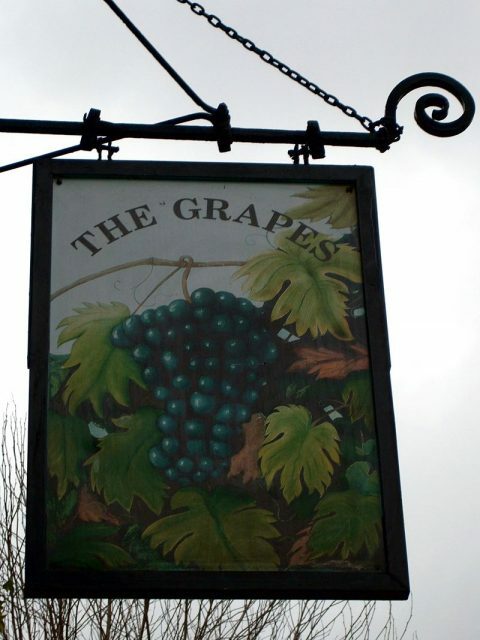 Though the second rumor can’t be confirmed, it goes without saying that The Grapes holds a firm position in London public house history. McKellen echoes this sentiment. “Anything spoken in the room is somehow in the walls … if only you had the right instrument you could bring it out again,” he muses. 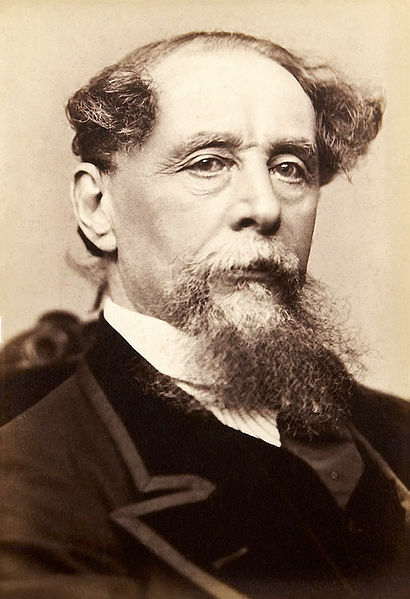 One anecdote The Grapes can be certain of is from a letter the ex-owners received back in 1946 from an octogenarian who regaled them with her memories of, as a 5-year-old child, sitting with Dickens, among others, in the upstairs room of the pub. While McKellen bemoans the inability to smoke indoors, he is a regular patron of his own establishment, attending the weekly Monday night pub quiz at The Grapes. Located at number 76 Narrow Street, the pub cannot legally admit children but welcomes dogs.